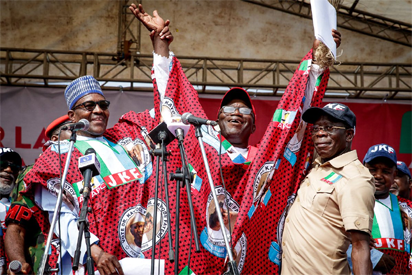 President Muhammadu Buhari, APC governorship candidate, Dr Kayode Fayemi and APC National Chairman, Comrade Adams Oshiomhole at the party’s mega rally in Ado-Ekiti, Ekiti State, yesterday. Photo: Abayomi Adeshida. The All Progressives Congress, (APC) candidate in the Ekiti governorship election, Dr Kayode Fayemi, has won the governorship election according to the results declared by the Independent National Electoral Commission in majority of the 16 local councils in the state. 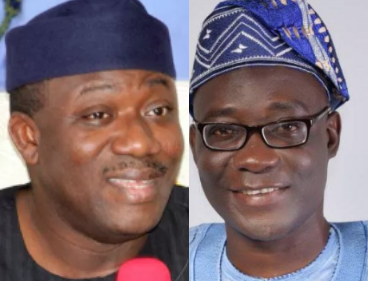 Fayemi, though, has not been declared the winner by the INEC yet which is as a result of an observation about an alleged inducement of voters in the election raised by an agent of the PDP. The INEC results, showed that Fayemi polled 197,459 votes. His PDP rival Professor Olusola Eleka got 178,121 votes.